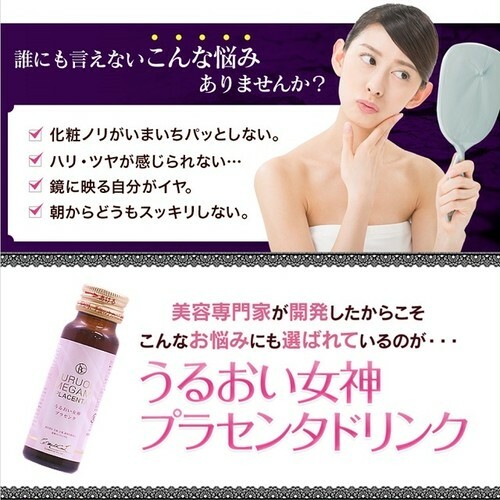 2,400,000 bottles, the best seller in Shonan Cosmetic Surgery Clinic!! “Uruoi Megami Placenta”is Placenta Drink boasting Immediate effects with highly concentrated Placenta extract. “Uruoi Megami Placenta”is developed by Dr. Aikawa of Shonan Cosmetic Clinic, who gives more than 10,000 shots of Placenta injection per 1 year. “Uruoi Megami Placenta”contains much of the ingredients considered as the effective by medical specialists. Expecting effects on a wide range, from beauty to health.